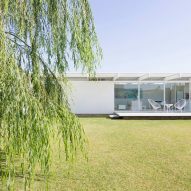 Argentinian studio Bernardo Rosello Arquitectura has chosen all-white finishes for this home in Buenos Aires, which was designed for one person but will eventually be expanded to fit a family. 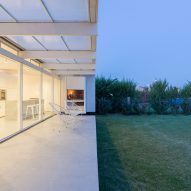 The architecture firm completed the minimal white property in Bahía Blanca – a port city in the Buenos Aires province. It is located in a residential neighbourhood called El Maitén, from which the house takes its name. The home comprises a long and narrow volume, running from north to south across the site. It was designed to be built within a year to quickly provide a home suitable for one. In total, the compact volume spans 70 square metres – not including the patio at the front, which is referred to as a gallery. This leaves plenty of space on the 730-square-metre site for an extension that the firm has planned for the front. "At the request of the owner, its realisation was planned in two construction stages: a house with an area of 70 square metres plus the gallery – which meets the needs of basic use for a single user – and a second stage with two bedrooms and a bathroom for future growth," said Bernardo Rosello Arquitectura in a project description. 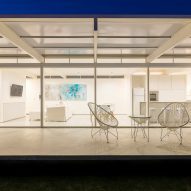 From the corrugated cladding and steel frame structure on its exterior, to the painted walls and wooden beams inside, the studio has made the house almost entirely white. Large expanses of glazing run along the front of the property, and slide open onto a raised patio. Here, a chunky chimney breast is also painted white. 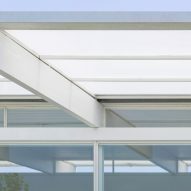 Translucent panels of polycarbonate are slotted into the overhanging roof above the patio to provide shelter from strong prevailing winds, while also allowing light to filter through. An open-plan living, kitchen and dining room adjoins the deck inside the residential wing. Furnishings in this area includes a glass dining table, white dining chairs and a pale sofa. The master bedroom is placed at the southern end of the volume in a portion with less windows. Appliances and the white-tiled bathroom are set inside volumes that help define different areas without using conventional walls, as well as providing closets for storage. The wall that faces the street is also covered in corrugated metal to provide privacy, with just a narrow gap left at the top for natural light. 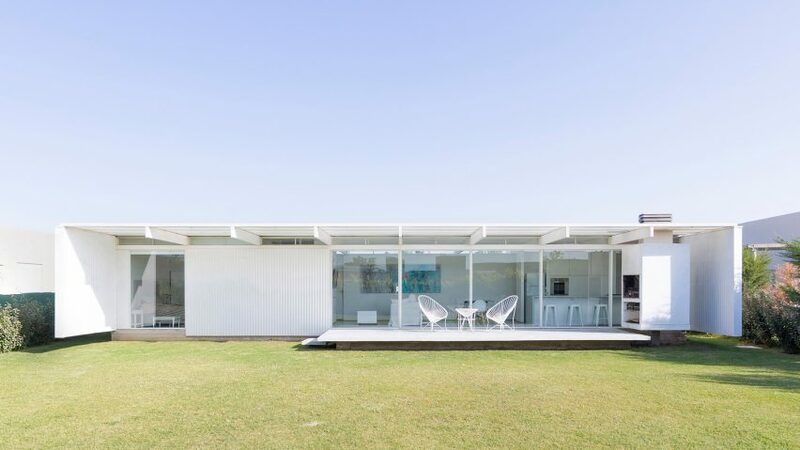 Also in Buenos Aires, BHY Arquitectos chose a similarly austere white palette for the design of Casa Lucia. Photography is by Ramiro Sosa.